Diamond Tennis Bracelet (Size 7.5) in Platinum Overlay Sterling Silver 0.33 Ct. Silver wt 10.13 Gms. Diamond (Rnd) Bracelet (Size 6 - 9.5 Inches Adjustable) in Sterling Silver, Silver wt 4.10 Gms. Diamond (Rnd) Bracelet (Size 6.5 to 9.5 Adjustable) in Sterling Silver, Silver wt 3.50 Gms. Explore the magnificence of Diamonds with a beautiful diamond bracelet. Stack em up high or wear independently and elegantly alone. Diamond bracelets will always be a jewellery piece that can add a dash of elegance and sophistication in an instant, so discover stunningly simple bracelets or something with much more sparkle. Cultivate a confident and glamorous look with top collections; Circle of Life and Constellation or perhaps a simple tennis bracelet. Update your arm candy with something different from TJC! Choose a spectacular yet enduring design that will endure your lifestyle as well as stay a prized piece in your jewellery collection. Find something that suits your personal style with a chunky pressure set design or something a bit flirtier with a think chain and little diamonds. 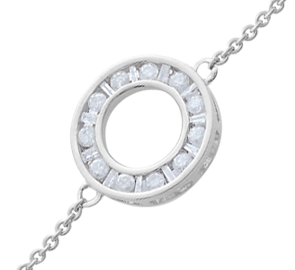 Wear your heat on your sleeve with a glamorous diamond bracelet.